Anyway, I mentioned that there would be a part two to the Dreaming Swan collection post, and here it is! 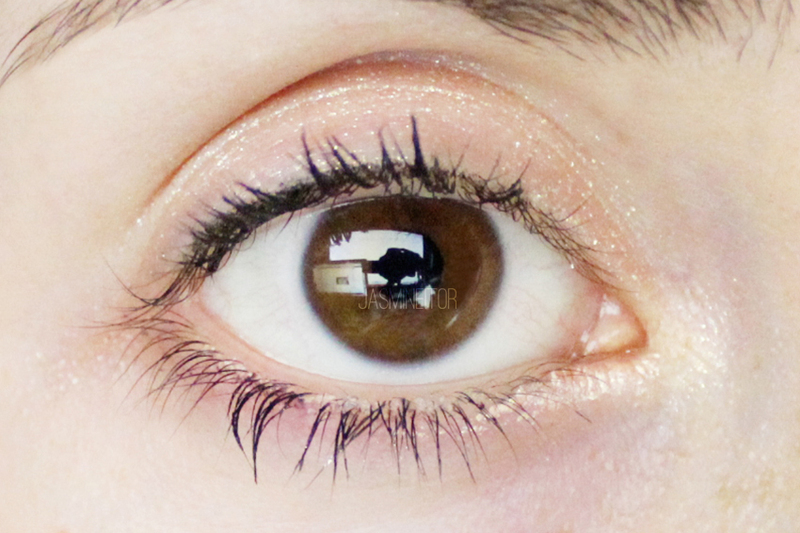 I’ll be talking about the other thing I picked up from the collection – the Shine Volumer tear drop liners. 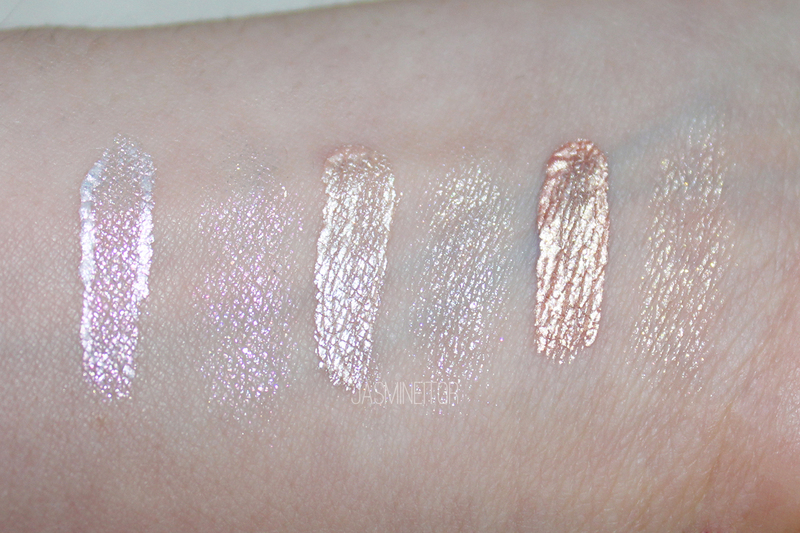 The Shining Volumer’s come in 3 tones, a cool toned pink glitter, a rose gold shimmer, and a copper toned shimmer. 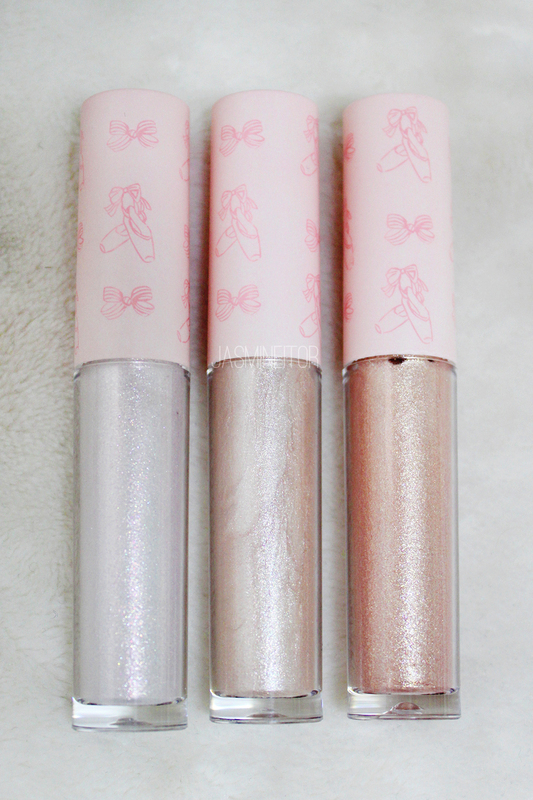 The formula is something that hasn’t been seen in Etude House products before so I was very excited for them! I ended up picking up all three because…reasons. As with the lipsticks, if you put the packaging together it lines up as one! Except for the green, the packaging is representative of what colour is inside (eg. pink glitter in pink box, gold colour in yellow box…). The names in English are from left to right, Dreaming Swan, Dazzling Toe Shoes, and Shining Tutu. Like the rest of the Dreaming Swan collection, these also follow the ballerina theme. Honestly my first impression of the applicator was that it was too thick to apply on the “tear drop” area, and I was right! It’s too thick to fit under my lashes without getting the glitter all over my eye and onto my dark circles e_e so I’ve been using this brush to apply it on my lower inner eye corner. 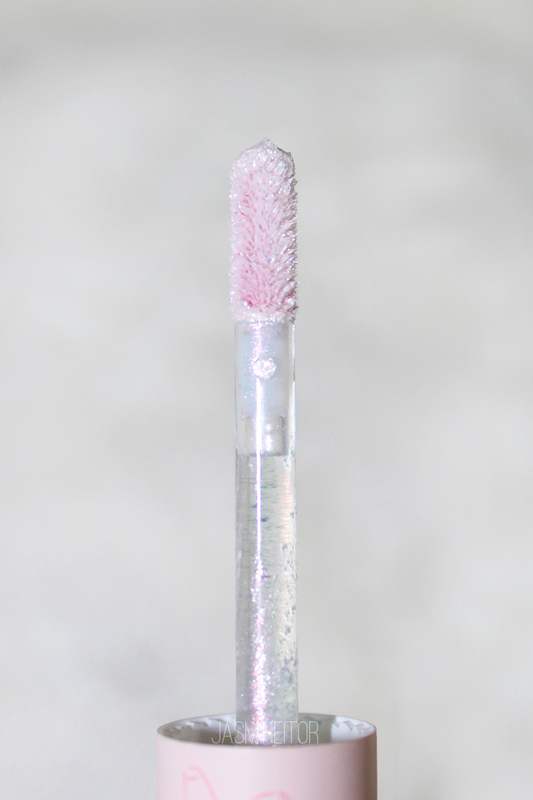 I just dab the brush on the tip of the applicator and apply it as I normally would. I tried taking a photo out of focus so you can see the colours of the glitter! 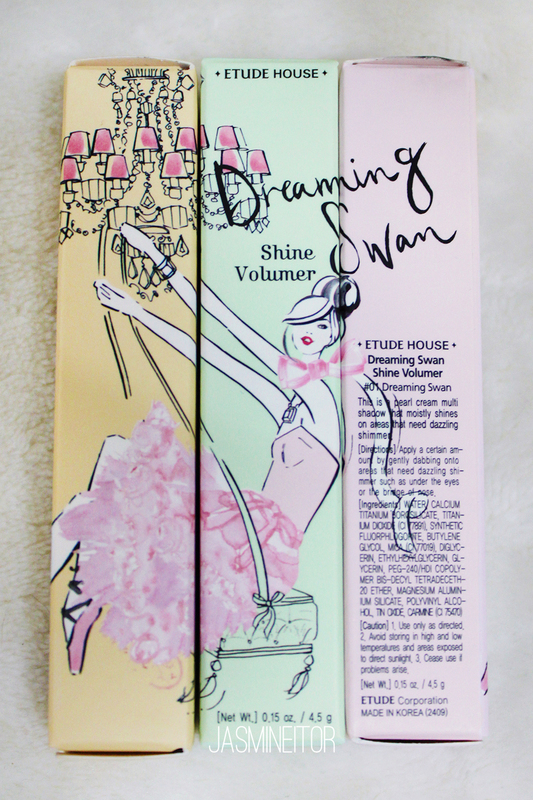 Dreaming Swan has the widest range, as a pearl pink base with bright pink, gold, and hints of green glitter. Toe Shoes is the cooler colour (as in tone, not style), with more of a silver base. However, it isn’t completely silver and still leans more towards a rose gold. Shining Tutu is the least glittery, and is more of a copper shimmer. I’d say it is the most opaque of the three! When I use these I dab the applicator in the middle of my upper lid and pat it out with my finger to get a thin, glittery finish. This can be done on top of other shadows without smudging if you’re careful and that’s how I’ve been using it lately to tie my looks together with a spot of glitter! 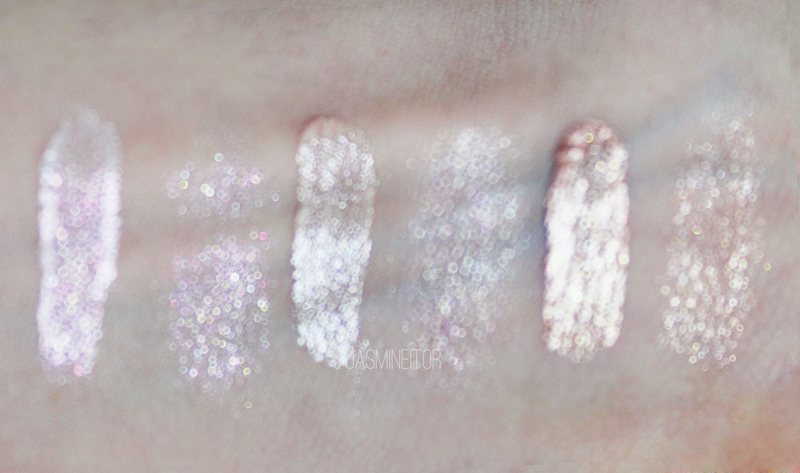 Like I mentioned before, #2 is less of a glitter compared with #1, and more of a shimmer. It’s the cooler between #2 and #3, so you can choose one or the other based on this. 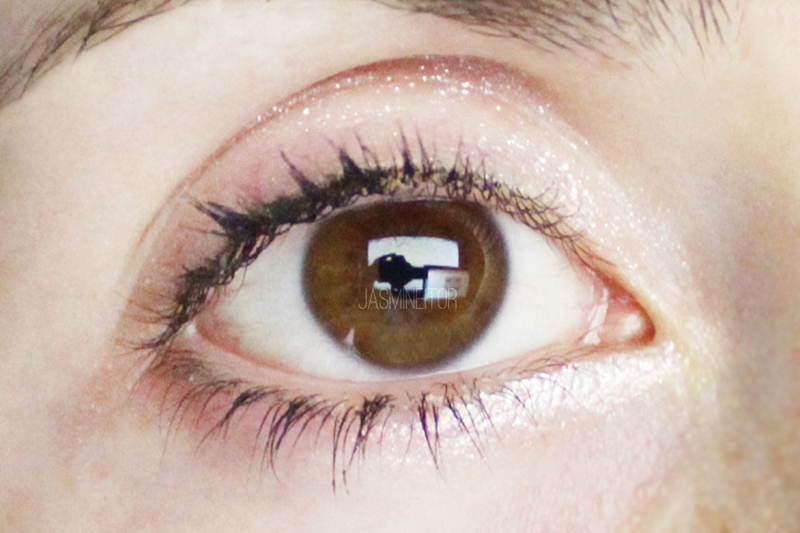 It’s the most neutral of all three colours so it can go on top of all types of eyeshadow without muting any of the tones underneath. Now I have to admit that looking at these swatches, #2 and #3 don’t look any different from eachother… ( •᷄ὤ•᷅)？I didn’t have the best lighting (still trying to figure out a good set-up for taking pictures), as I find that they are quite different, with #3 being the most pigmented of the three. 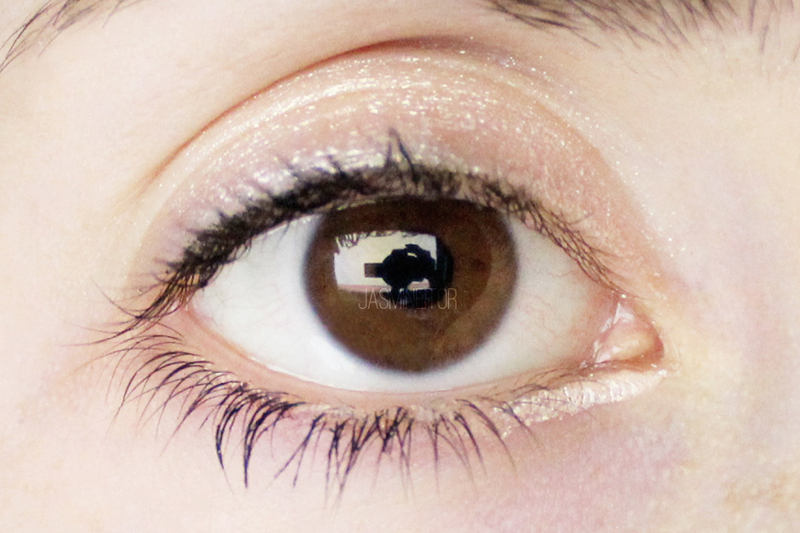 It leans towards a warm coppery tone that matches Etude House’s Tear Drop Liner #4 in “Sunlight Tears”. If you are the type to like warm looks I would choose this one! 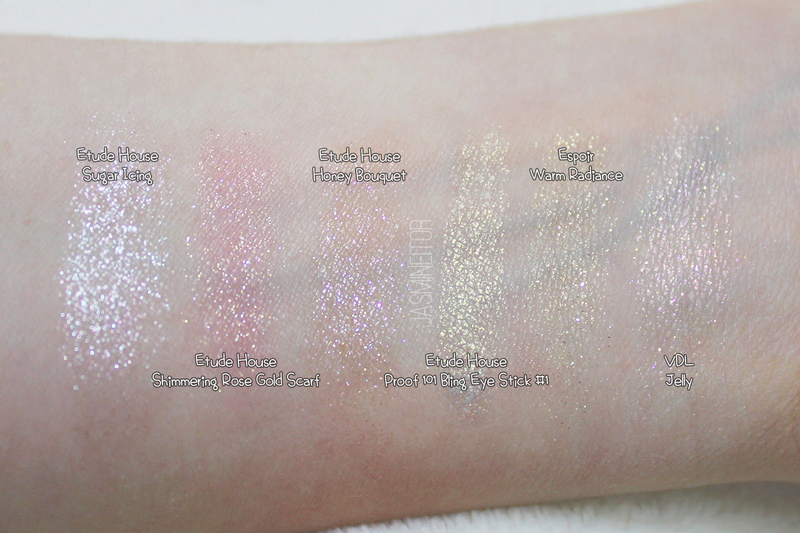 I decided to dig out my other two Etude House tear drop glitters and all of the shimmer/glitter shadows I have from my years in Korea in order to compare them with the Shine Volumers. Accidentally did the Shine Volumer swatches out of order here (~_~;). As the caption says, the order is 1, 3, 2! 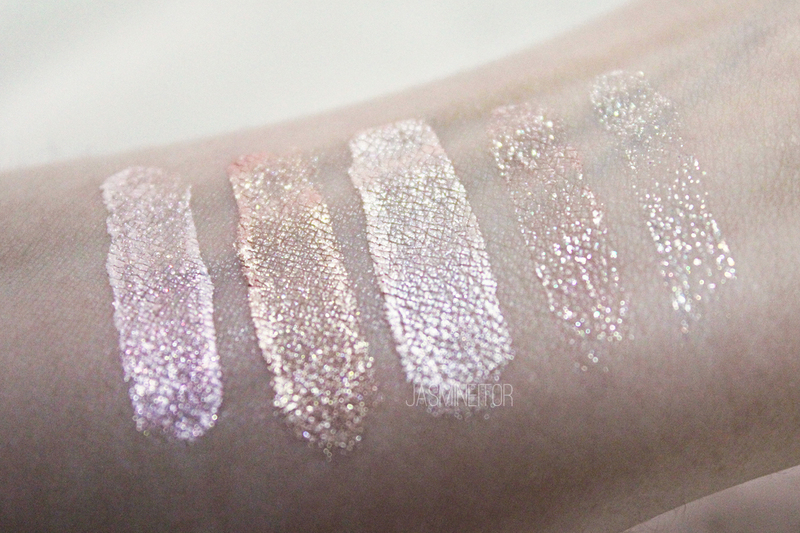 Anyway, I swatched Etude House’s Tear Drop Liners in #4 and #2, and as you can see they are significantly less opaque than the Dreaming Swan ones! The formula is completely different, with the Tear Drop Liners having a more transparent base with coloured glitter added after. 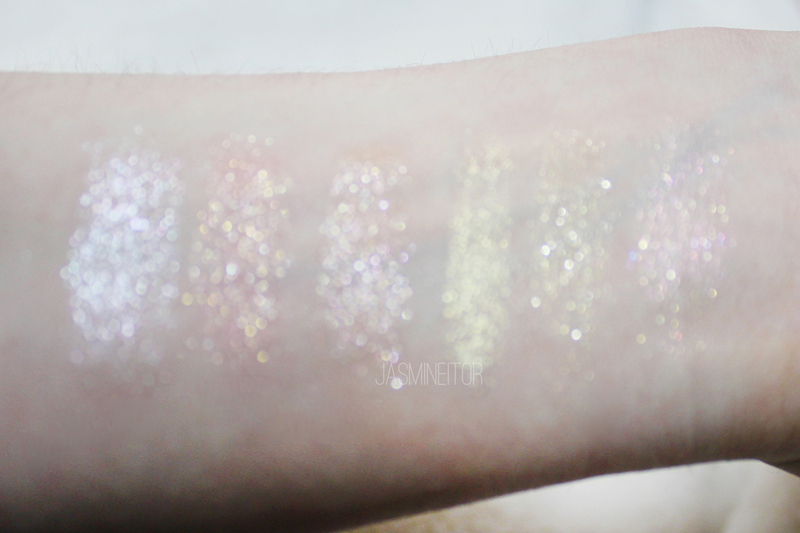 The Dreaming Swan line has a creamier, coloured base with less added glitter. 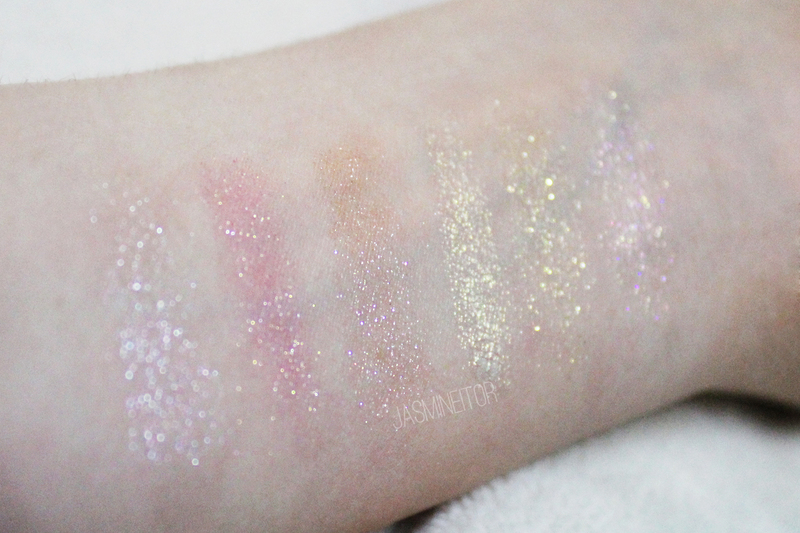 Next I swatched all of the different shimmer shadows (and one shadow stick) I had from Etude and two other brands. 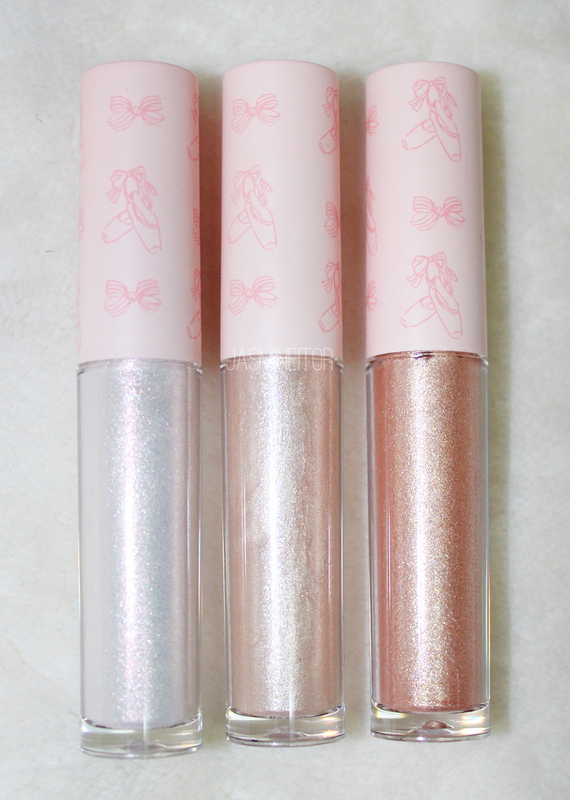 If I had to compare these with the Shine Volumers, I would say that Etude House’s Bling Eye Stick is the most similar in terms of opaqueness (not sure if I made that word up or not) and shimmer type. Colour-wise none of them are similar to the Shine Volumer tones, so I can say the SV are worth checking out even if you own a lot of glitter shadows already. Final verdict: Very happy with these! I’m loving the versatility that comes with them as a liner or a glitter top coat over your regular shadows. Definitely enjoying the new formula, just wish there had been a pure silver colour! As #2 and #3 are rather similar, if you have to pick up one I’d pick one based on the tone you want (cooler vs warmer) as I explained in the detailed swatches. One thing I also recommend is using them over primer if you use them alone, as the thick formula leads to creasing throughout the day if you don’t. Great item!